Contemporary California cuisine in a unique glass-box penthouse setting above a Lexus dealership in Escondido. 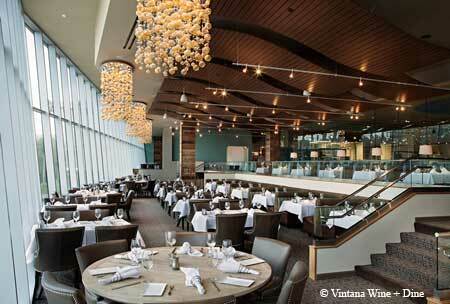 : Once you get beyond the car dealership and ride up the glass elevator, another world unfolds at Vintana. Diners can head to the colorful bar, which has more than 100 vodka selections and festive cocktails like the famous mai tai; or to the al fresco patio with fire pits and live music; or the expansive dining room with floor-to-ceiling glass windows, dangling bubbly chandeliers and cozy booths. The menu uses a mix of seasonal and local ingredients and offers many hearty dishes. We recommend the Brie with jalapeño jelly or the meat and cheese platter with house-made pickled vegetables, marinated olives, spicy nuts and bacon-wrapped dates to start. Pacific rock shrimp mix nicely with sweet corn fritters, doused in a spiced maple and honey-bacon crème fraîche. For the ultimate meat experience, try the filet trio with all the accompaniments, like mushrooms, bone marrow butter, asparagus, crab, béarnaise and blue cheese. Meanwhile, pork porterhouse is elevated with fig jam and a prosciutto demi-glaze with pan-roasted pork belly, Brussels sprouts and sweet potato hash. For lighter fare, go for the vegetarian plate or the macadamia-and-coconut-crusted sea bass. Service is thoughtful and live music adds to the appeal.